I love when I can review a book that hasn't even been released yet. It's lovely. Marianna Sommer believes she knows where her life is headed. Nineteen years old and Amish, her plan is to get baptized into the church, marry Aaron Zook, and live in the only community she's ever known. I love reading Amish books. I love how they live life so simply and I think it can really teach us a thing or two, about how we could live on less and still be just fine. I've had a lot of experience with Amish growing up. Where my grandparents lived (my grandma still does) is a HUGE Amish community. They are so kind to everyone and just love life. That's how we all should be. In the living room is 2 rocking chairs and a couch, nothing more but an oil lamp. Kitchen is just a table and chairs. It's just so simple. I really enjoyed this book. It's an unedited copy, so there were a few mistakes, but I could tell what was really meant. The book had nice writing style and it captured you. I read this book in less than 324 hours. I'm one who usually picks up a book reads 20 pages and forgets about it for a long time. OR I take a week to read a book. This was a quick read and I'm not going to lie, I CRIED a time or two reading this book. Tricia's writing is so vivid that as you're reading it has a way of drawing you in close you feel as though the characters are real and you're right there with them. I could pictures every single scene in my head. 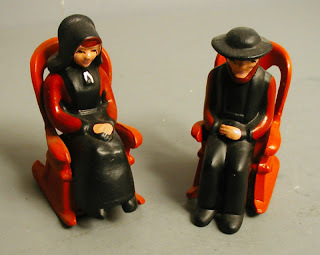 Tricia is giving away 10 copies of Beside Still Waters AND a pair of Amish Salt and Pepper Shakers on her blog during this event. Each person who enters the giveaway will receive a FABULOUS Montana Amish Calendar. Hurry, it’s only available while supplies last so hop on over to Tricias blog now to enter! To view what others on the Litfuse Blog Tour are saying about Beside Still Waters, click, HERE. That looks like a great book - I love Amish books! Thanks for the review! Oh, I love book reviews, as I love to read. This one sounds good. I have some book reviews on my site too. I am reading Water for Elephants right now....I'm a little late on that one, I know. But, I gotta finish it before I see the movie. Happy reading.